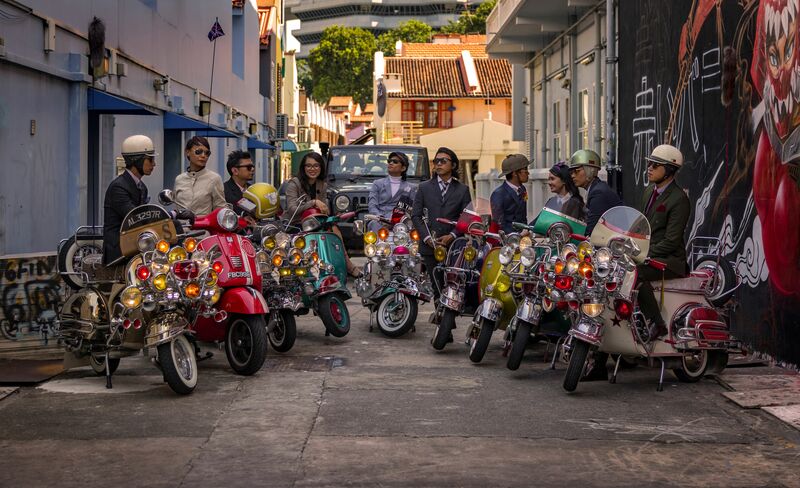 InstaScram scoots with the Vespas and Lambrettas of Singapore's very own Mod Squad. Here's a glimpse of their world of rad rides, groovy music and their favourite hang-out spot, vintage cafe Kombi Rocks. Join biker Nessa and her Triumph Scrambler as she rides to photo-worthy places in Singapore. What does a certain community in 1960s post-war London have in common with one from present-day multi-cultural Singapore? It turns out that the common denominator is their loyalty to a little-known subculture called "Mod". InstaScram rides with Singapore’s very own Mod Squad, a group of homegrown bikers living a carefree, colourful life full of savoir faire, groovy music, impeccable style and of course, pimped-up Vespa and Lambretta scooters. To understand the Mod, we have to understand their style, music and ride. Their style is heavily influenced by the French and Italian aesthetic, with dapper suits and detailed cuts for the men. The ladies take their inspiration from the style icons of the Swinging Sixties for the definitive ‘Mod Style’ look. Then, comes the music. The original Mods from the late 1950s were attracted to the then-unique sounds of modern jazz and rhythmic blues, which allowed for funky and improvised dance moves. Thirdly and most visually, their ride. It is not coincidental that they have wholly embraced the scooter for its practicality and scope for customisation. As the engine of the scooter is enclosed within the bike frame, the pristine quality of their outfits would always be protected from excessive oil, dirt and grease. From an outsider’s cursory glance, the Mod lifestyle seems contrived and "peacocky". This is especially conspicuous in Singapore. Our tropical weather scorches us, and the ownership of motorcycles is subject to three types of increasingly expensive taxation: standard road usage tax, a certificate of entitlement (COE), and the recently implemented Additional Registration Fee (ARF) in 2017. But the ever-passionate community of Vespa and Lambretta enthusiasts continually seek to invest time and effort to keep their vintage scooters from becoming extinct. Thus, preserving a part of motorcycling culture that is full of meaning and history, to be experienced generation after generation. And they look good while doing it. There have been "Mod revivals" over the last few decades, not only in United Kingdom and Europe. But Malaysia, Thailand and especially Tokyo, Japan, which has one of the strongest Mod followings in the world. 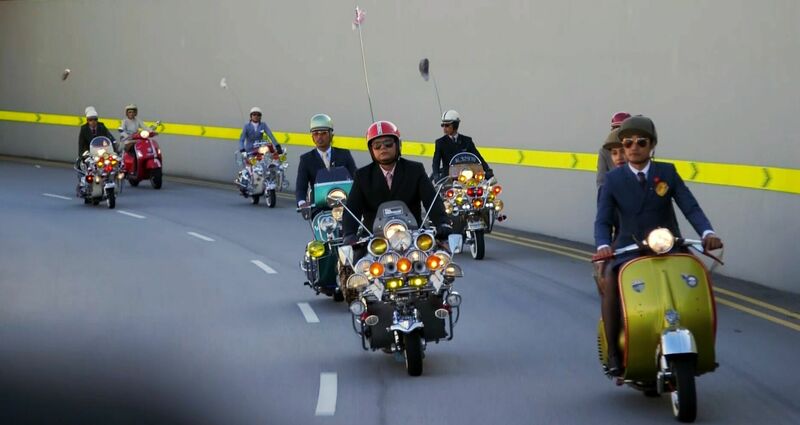 The Singapore Mod Squad maintains close relations to their fellow Mods in neighbouring countries, often riding their scooters to participate in their events, or hosting them when they travel here. Especially for events such as the Mod’s May Day, or the Mod Swing. 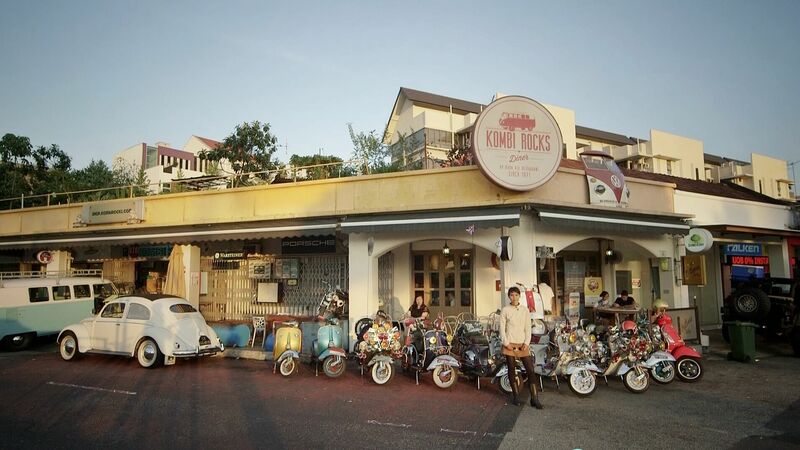 Back here in Singapore, we take to the streets from Bugis to Kallang, past Ang Mo Kio and Yio Chu Kang, to journey to an offbeat, vintage-styled cafe, Kombi Rocks, which welcomes everyone to enjoy the experience of a unique time and place. The theme of the cafe is not just for kicks, but rather, it stems from a personal passion. The owner, Chef Hai, is an avid vintage vehicle collector, restorer and a rider himself. His workshop is just a few doors away from the cafe. All of the vintage vehicles lining the lane along Yio Chu Kang Road and even in the cafe, like the Volkswagen Kombi and Beetle, Chevy Impala and numerous scooters, belong to him. You can even rent them for events like photoshoots or weddings! The walls of Kombi Rocks are lined with vintage memorabilia, from posters to musical instruments, vinyl records to various antique paraphernalia. And it doesn’t stop at reliving the vibes or the vehicles of yesteryear. The cafe also retains the menu of its predecessor as well. Before 2012, Kombi Rocks was known as Koon Kee Restaurant, which served Asian-Thai fusion cuisine, and was owned by Chef Hai’s father, Chef Lim Koon Kee, since 1971. The Singapore Mod Squad and the team behind Kombi Rocks may be just a couple of the groups that wholeheartedly subscribe to the lifestyle of preserving the vintage, which makes them as rare and valuable as the vehicles they restore. With the current motorcycle industry heavily saturated with newer and more easily ridden models, it is heartening to know that a part of motorcycle heritage is preserved right here in Singapore.